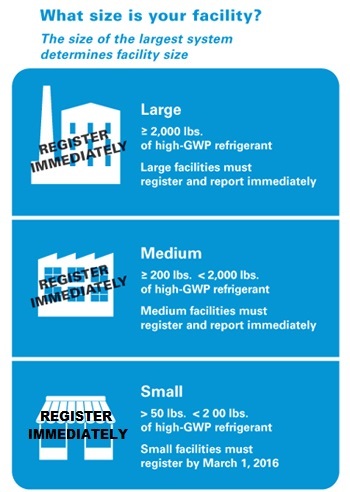 Refrigerant Management Program (RMP)-Is your business registered? R-22, R-404A, R-407A, R-507, and many more. Keep all service records on-site. Companies that do not comply are subject to site visits, notices of violation and potential fines. ARB staff will hold a free online webinar on Monday December 12, 2016 at 10:00 to 12:00 noon Pacific Time to review the requirements of the regulation and the procedures for registering, filing the Annual Report, and paying the Annual Implementation Fee using the online R3 application. The announcement for the webinar can be seen at this link. Register for the webinar at this GoToWebinar link. The slides for the webinar will be published prior to the webinar. For reference, slides from the most recent R3 training webinar are available at: January 2016 Webinar Presentation, and as notes pages at: January Webinar notes pages. A recording of the Webinar is available at: January 2016 Webinar Recording. keep service records on site. These facilities must register using the R3 tool; facilities with 200 lbs. or more must also submit annual reports by March 1 of each year.